The new G size enclosure. 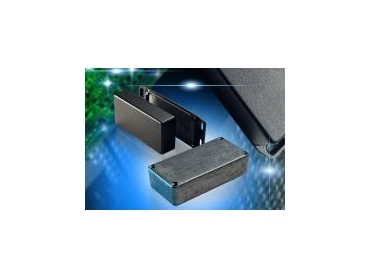 HAMMOND Electronics has introduced another size in its 1590 Series of die-cast aluminium enclosures for use in the electronic, electrical and allied industries. Available in standard, flanged, flanged lid and waterproof versions, the new G size enclosure measures 100 x 50 x 25mm. All versions feature a very shallow draft angle to ensure easy PCB mounting and use countersunk screws into drilled and tapped holes to allow repeated openings and closures. Lapped joint construction ensures good continuity between the lid and base. The units are available in either natural or powder coated painted finish. The flanged version has factory fitted flanges assembled to the base, enabling the enclosure to be screwed down to a surface; the lid is still accessible for removal. In the flanged lid version, the lid is extended beyond the body to enable the enclosure to be mounted to a surface; as an additional benefit, the lid screws are positioned against the surface, improving security. Waterproof versions of the standard, flanged and flanged lid units feature an extruded silicon rubber gasket around the lap joint in the lid to give sealing to IP65. Electrical continuity between the lid and base is maintained.